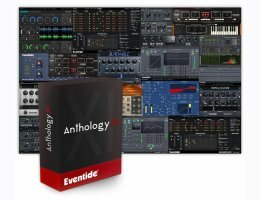 Anthology XI is comprised of 23 mixing, mastering and multi-effect plug-ins based on 40 years of Eventide studio mainstays like the H910, H949, H3000 Factory, Band Delay, and Omnipressor. It also includes future classics like UltraChannel, UltraReverb, Quadravox and Octavox that will help you solve problems and inspire new creative possibilities. Anthology XI is a true must-have for any size studio. A tour de force of digital audio processing, Anthology XI features the best of the past and future. Included is the original Clockworks Legacy bundle - Instant Phaser, Instant Flanger, H910 Harmonizer, H949, and Omnipressor. From the H3000, Factory and Band Delays offer unique creative possibilities that can be used to breathe life into any instrument or vocals. Anthology XI comes loaded with more than 2,900 presets across the 23 plug-ins, many of them created by artists like Dave Pensado, George Massenburg, Tony Visconti, Vernon Reid, Richard Devine, Joe Chiccarelli, Roy Hendrickson, Chuck Zwicky, Robin Finck, Chris Carter and Suzanne Ciani. An iLok account is required to authorization Eventide products. With the iLok License Manager, you can deposit your license either on a 'computer' or on the 'iLok Dongle. (iLok keys can be purchased from www.ilok.com or at your local dealer).